One of the main recurring themes of The Risks of Hazard blog is the importance of location-based risk information. However, there is one major peril that does not require such property-specific data: wind. Wind is one of the most destructive perils that can be insured against. Thus, it is very well modeled around the world, including USA hurricane, European windstorm, Asia/Pacific cyclone, and straight-line wind in convective storm. Wind does not include tornadoes, which are associated with convective storm models. It is the original peril to be modeled widely for insurance purposes, and wind forecasts and models always receive broad media exposure. Wind is extremely interesting for both the general public and insurance specialists. Unlike other perils capable of wreaking significant damage, it is atmospheric and not based on or within the ground. Beyond defining very broad parts of the globe where they can form, location plays almost no part in determining the risk of winds causing damage. Of course, understanding the location of properties exposed to wind risk is important, but that’s related to geocoding. Wind causes damage in broad swaths, sometimes hundreds of miles wide, and any wind model that has risks varying noticeably within neighborhoods, or even cities, are exaggerating the usefulness of their modeling technology. A perfect recent example of a wind event that causes such widespread losses is the joint European windstorms Mike and Niklas. 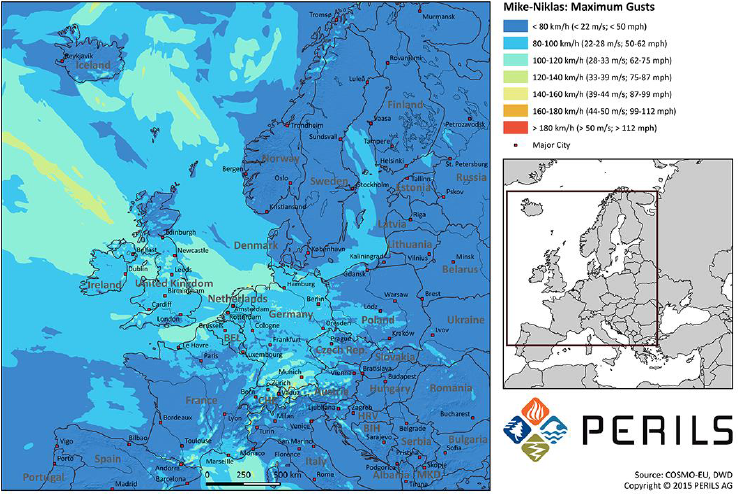 As reported by Perils on May 11, these two almost-concurrent wind storms caused nearly one billion Euros in losses across an area that completely encompassed BeNeLux and Germany, with Munich receiving peak winds over 100 km/h. The map on the Perils report displays the variation in wind strength that is relevant to wind: most of continental Europe. Unlike flood, wildfire, or earthquake, it is irrelevant where a property is located, beyond the city or state level. When wind happens, it happens as a vast wall of air causing very widespread damage. As a result, the main concern of wind models is not locating the potential exposure to wind, but quantifying a building’s vulnerability to wind if it happens, because that is a widely variable factor that can be modeled and the source of the uncertainty that carriers need to minimize.